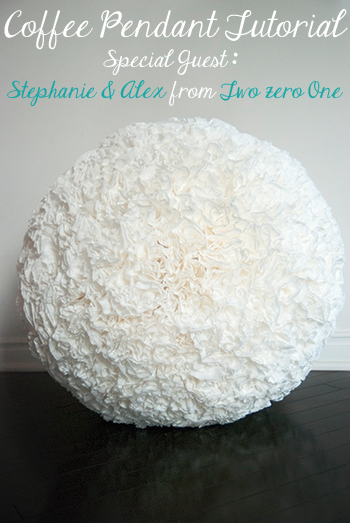 Ladies and Gentleman, please give a warm welcome to Stephanie and Alex from Two Zero One. I've always wanted to introduce someone like that. These two love birds must have a special place in their Canadian home for Black and White like I do, I mean just take a look at their house tour. My gosh, that bathroom is crazy gorgeous!! I’m thrilled to have them here today at Black and White Obsession and they’re here to show you how to make your very own Coffee Pendant. For those of you just tuning in, or confused by the stunning faces gracing my blog- they’re here to show you some of their hard work. You know so you don’t only see only my projects and read my lame quirky jokes. 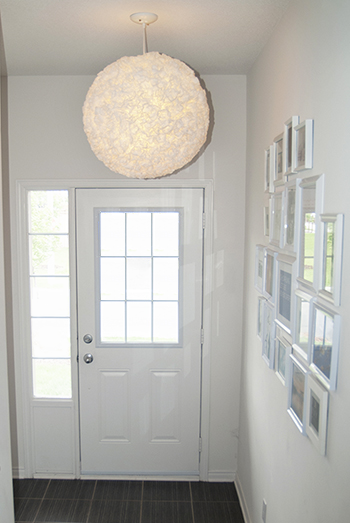 If your house is anything like ours, you most likely have heaps of ugly light fixtures that need updating. The problem for us, is most of the ones we liked were incredibly expensive so I decided to make my own huge pendant in one afternoon using coffee supplies I always have on-hand. If you would like to have a bit more colour, it is possible to dye the coffee filters with food colouring in a bowl of dyed water or to use paper that has been cut into circles. Another idea would be to use a coloured electrical cord, or one with a metallic finish such as silver, to give it a more modern feel. To start begin by rolling up the filters. Then, glue the coffee filters in one area of the lantern and slowly spread outwards leaving some space between the filters so the light will shine through. I found it was helpful to glue the coffee filters at the bottom to the lantern, and on the sides to attach the new filter to the previous one. To help prevent your light fixture from rolling around while you work on it you will want to lean it against something, like a roll of paper towels or a wall. Once completed and installed this light fixture will give a nice diffused light to the entire room, and would look especially striking if it was grouped together with several lanterns in various sizes. 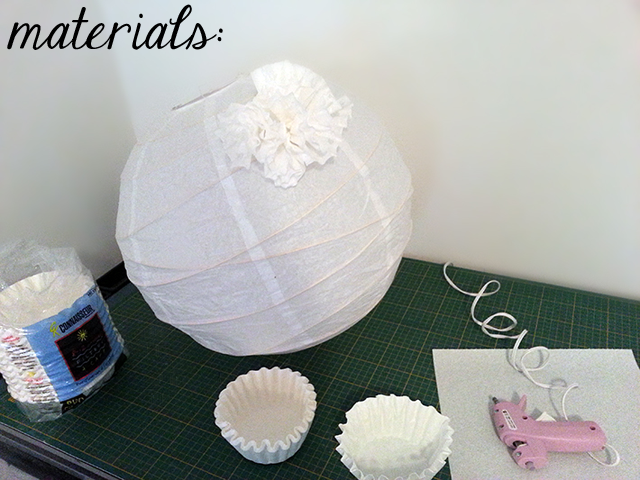 If you’d like to read more about how Stephanie and Alex knocked out their Coffee Filter Light, here’s the full tutorial. Boy do I love reading Canadian blogs!! The slight difference in language is an enjoyable change of pace. What ‘colours’ would you make your coffee pendant? Wouldn’t it be fun to throw in a two tone (holla Black and White) or even some ombre action? Very cute! 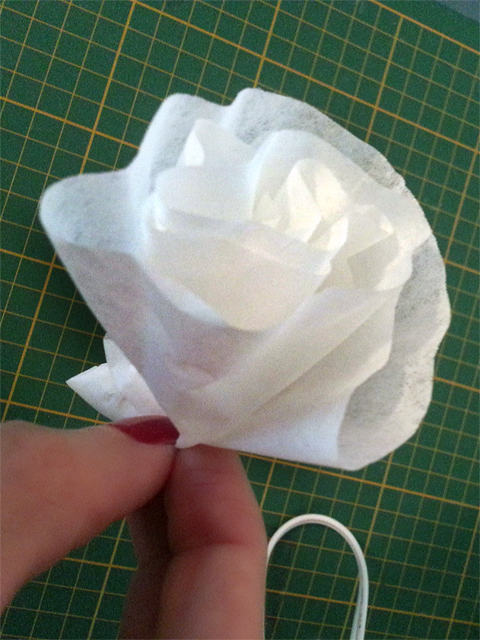 It's amazing how something so simple as a coffee filter! I L-O-V-E it! Those two are so talented. I want one for myself but am not 100% sure I couldn't resist playing around with it like a big fluffy ball! Haha I hear ya!! Although I probably would have cookie crumbs randomly hot glued in places. Wait am I the only one who crafts while eating? !